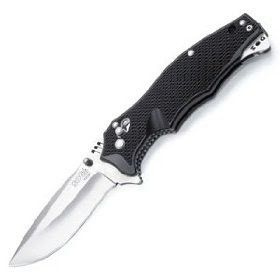 The SOG Arc-Lock I Vulcan manual knife is an award winning combination of construction and style. By far the best manual knife I have found in a while. This knife is easy to open, opens and locks open nice and tight, and is easy to close. From SOG, it is made of top notch products, just like you would expect. This knife has the patented Arc-Lock system. This system provides strength, speed, safety, ambidexterity, and durability. Read more about the Arc-Lock system under the features tab. The Vulcan series is named after General Electric’s M61A1 Vulcan is a 6-barrel 20mm cannon of the gatling-type. It fires standard M50 ammunition at 6,000 rounds per minute and is integral part of the armament of modern fighters such as the F-15, F-18 and of course the F-16.